A special Thank you to Quirk Books for sending me this books to review. 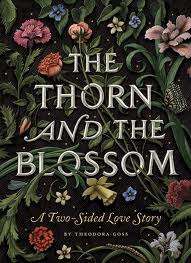 The Thorn and the Blossom is a remarkable literary artifact: You can open the book in either direction to decide whether you’ll first read Brendan’s, or Evelyn’s account of the mysterious love affair. Choose a side, read it like a regular novel—and when you get to the end, you’ll find yourself at a whole new beginning. The was one of the most beautiful books I have ever picked up. If someone has lost the joy of reading proper books, all they have to do is pick this little number up with its hardback case and accordion binding And they will remember what it is that attracts people to the real thing as opposed to the increasingly popular e-book! When I began to read the book, however, I was not struck by the same level of beauty and joy. Both sides of the story start of as this really sweet love story. Two people, inexperienced in love, meet and begin to find the joy of a friendship turning into something more. They meet in a bookshop, which I loved, and the story tells of them firstly spending time together at the Cornish coast and then together on a university campus. The rest of the story didn't quite meet with my expectations though. There were circumstances which tore the lovers apart which I didn't feel the author made terribly clear to the reader. There were also a couple of other characters involved in the story who were under developed and the plot wouldn't have suffered any of they had been described more to the reader or indeed shown how they were placed in the story. The ending of the book does pick up a bit and has a wistful fairytale/tragic romance feel to it, but at the very last minute the book suddenly ends, as I'd the author had simply ran out of ink. This kind of ending can go one of two ways, some readers may find this appealing, allowing them to carry on the story in their own minds and decide for themselves what the fate of these two characters is going to be. For me though, I would have preferred a bit more of a resolution, or even more of a lead into a resolution as to what happened with the two characters. A beautiful book, a nice storyline and a very quick read. Excellent if you are looking for something different or something to bring you back into reading concrete books. If you are looking for something more substantial or are someone who needs a concrete resolution to a book, this might not be for you.